An easy, healthful, sweet treat for the Carnival season! In a medium-sized microwave-safe bowl, heat unwrapped Double Chocolate Chunk Quest Bar® for 10 seconds. Using a rolling pin, roll the bar out to 1⁄4-inch thickness. Bake for 4 minutes, or until bar is lightly crisped. Remove to cool. Break the crisped bar into pieces, place in a mini blender, and blend into a crumbly powder. In a medium-size mixing bowl, add vanilla protein powder, the crumbled Double Chocolate Chunk Quest Bar, almond flour, cocoa powder, zero-calorie sweetener, baking soda, and salt, and mix well. Add almond milk and vanilla extract. Blend cake base until fully incorporated and mixed well. Coat a 9-by-13-inch glass baking dish with nonstick cooking spray. Pour in batter. Bake 18 to 20 minutes, or until an inserted toothpick comes out clean and cake is completely cooked and springy. Remove and let cool. Break the cake into small pieces, and place in a large mixing bowl. For the frosting: In a medium-size bowl, add vanilla protein powder, cream cheese, zero-calorie sweetener, sour cream, and vanilla extract. Mix until smooth. Assembly: Add frosting to crumbled cake, and mix together until all frosting is incorporated. Cover bowl with plastic wrap and place in freezer for 20 minutes. Break chocolate into even-size small pieces and heat slowly to melt. 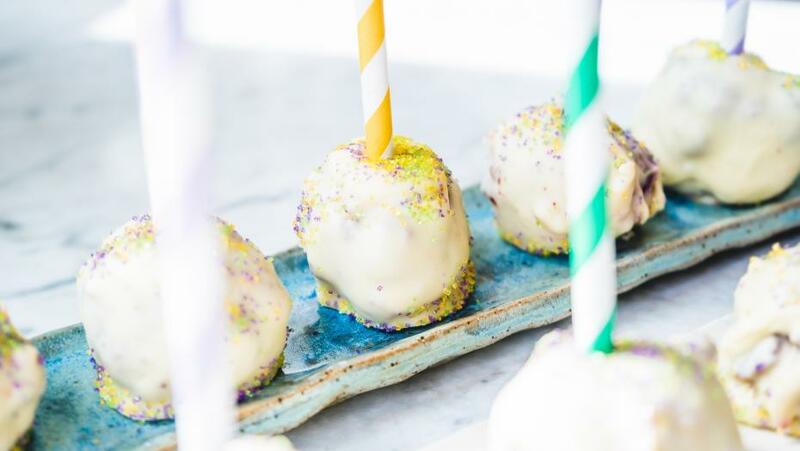 Carefully dip each cake ball into melted white chocolate. Gently tap the edge to remove excess. Place each pop on wax paper and insert colorful straws. Chill for 10 minutes in freezer, or until white chocolate hardens and creates a shell. Roll in colored sugar sprinkles to decorate in festive Mardi Gras colors!